Last week I spoke at the awesome new meetup Agile 25×20 which is run by Mike Pearce of Moo. The event is based on pecha kucha, speakers have 25 slides, all of which auto advance after 20 seconds. So 8 mins 20 seconds in total, with a chance for questions at the end. For the audience, this means that talks are short and to the point, there isn’t the time for speakers to dwell on slides. For the speakers, this means being prepared; 20 seconds can seem like a really short time when you have a lot to say, or a long time if you run out and you’re waiting for the slide to progress. It also means being really clear in what the focus of your talk is. As a speaker, I like the weighting on questions as I prefer a conversational style and the relaxed group (and beer) help the post talk conversations too. 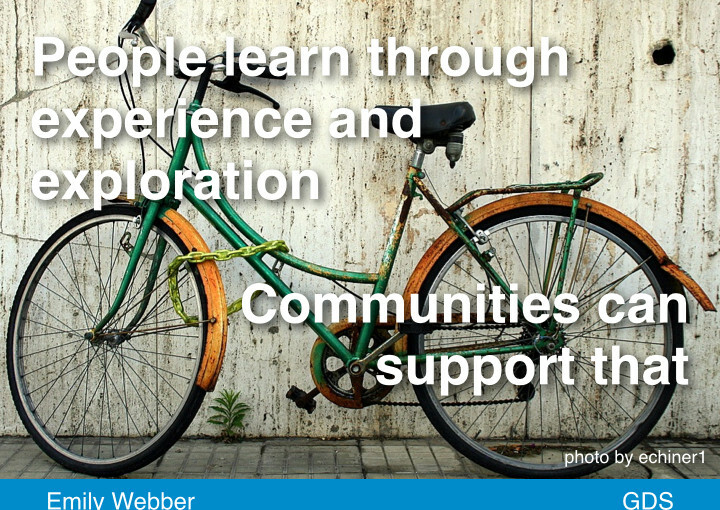 My talk was on the value of communities and continued learning (of agile) and the slides are below. Previous Best agile training? Just do it! See you at Moo tomorrow. Which slides are you going to cut?